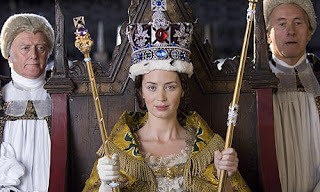 People think of Queen Victoria as an unamused, slightly drab old trout, with a bun hairdo and an oversized empire. For much of her reign she wore widow’s weeds, and was deeply reclusive, self-absorbed and unpopular; though she played a mean Judi Dench. But what was the Young Queen Victoria really like, at the height of her powers, in the full bloom of youth? The look and feel of this movie are superb — high production values with cannily chosen locations, wonderful costumes, and a cast full of excellent lookalikes, from a Duke of Wellington with a huge hooked nose to an extraordinarily lifelike Wiliam IV, who does a marvellous rendition of the Sailor King’s famous August 1836 after-dinner rant against the Regency plan. The womenfolk are good, too, especially Miranda Richardson’s scheming Duchess of Kent, who, you will remember was a Right Old Bag. By the way Prince Albert was a handy polymath, but don’t be deceived by the above picture. He was not, in fact, Britain’s first man in space. A film like this depends on the leads, and they do not disappoint. 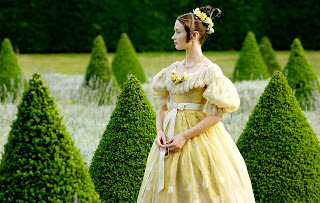 Emily Blunt has the look and feel exactly right, with Rupert Friend’s Prince Albert almost as brilliant. It’s one of history’s great full-on love stories, sensitively and artfully conveyed, excellently acted. For a hoary old historian like me, costume dramas are snacking on Cinder Toffee; tasty, but you have to fight the temptation to come out with old buffer comments about anachronistic details. The way the film sometimes risks taking itself too seriously is certainly characteristic of the subject. Something that sometimes surprises research students when they first encounter Queen Victoria up close and personal is the way people took regular serious pot shots at her. The Edward Oxford assassination attempt is rather sexed up for the movie, but the intentions are good, and I think we can let it pass. Characterisation’s excellent, but this film’s Big Problem is the ending. It phuts out a bit into a sequence of one liners about what a jolly good thing Queen Victoria was. Naturellement, but why? The script would probably have done better to draw stumps earlier, my preferred option, or even given some opportunity to get the Kleenex out with a couple of High Victorian mawkish deathbed scenes. Perhaps historical ignorance has now reached such a low in our glorious land, 3% of whose inhabitants are alleged to think Charles Darwin wrote The God Delusion, that such an ending is necessary. A sequence of one liners on a black screen does not quite account for the emotional landscape of the world’s most famous almost-dysfunctional family, or does it? It surely maketh not for high drama. Some people hate the subject anyway. Friday the 13th, Sparta, or Rocky lovers, along with many Frank Miller fans, will give this one a miss. Me, I’m a closet Queen Victoria fan. Queen Victoria fans do it in the closet, obviously. The film is a rather Saga Holidays view of British history, I suppose, with a slightly lame ending. But it’s league division one costume drama, brilliantly acted, and it does pretty much exactly what it says on the tin. Happy and Glorious? Certainly. Victorious? Almost. An experimental comment to check out the problem advised by Peter Kirk (who managed to leave his comment in the last entry instead). If everything's working, this should post OK. There's a town here called "Ruatoria" - translates to "The Footstool of Queen Victoria". What devotion she inspired. "The Footstool of Queen Camilla" - no, can't see that. Saw the film on Saturday. I remained fully conscious throughout. One wishes there was some sense of the society into which she was born - the one Shelley railed against, and which was changing so rapidly with the advance of inudtrialsiation. But, as you say, jolly good on a posh Mills and Boon level. My post-flim activity was the v difficult task of awarding the funniest-wig prize. What a splendid display of bravura bouffant barnets. Lord Melbourne couldn't keep his hands off his. King William IV's was the most explosive since Amadeus. Michael Maloney was totally upstaged by his wiggy wonder. A tiny tsk! to the research department. Queen Victoria wore her wedding ring on her RIGHT hand, in the German fashion.